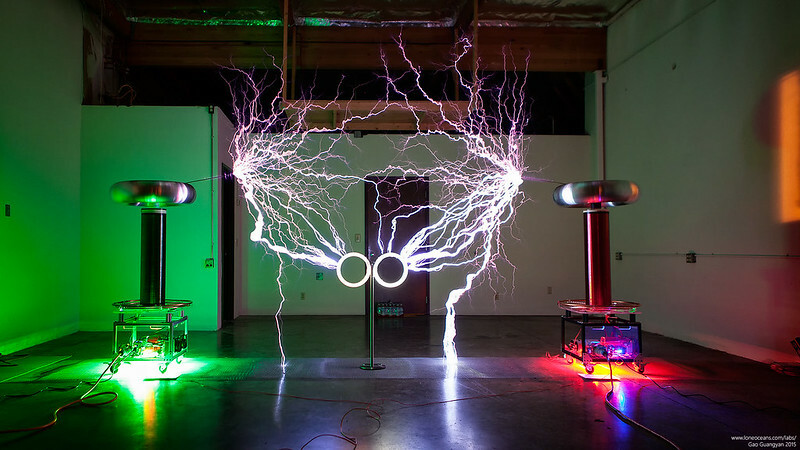 The Model 82 Tesla Coil platform builds upon the work of my DRSSTC 3 and was designed from the ground up with the primary purpose of developing a powerful and compact twin museum-grade electronic Tesla Coils. 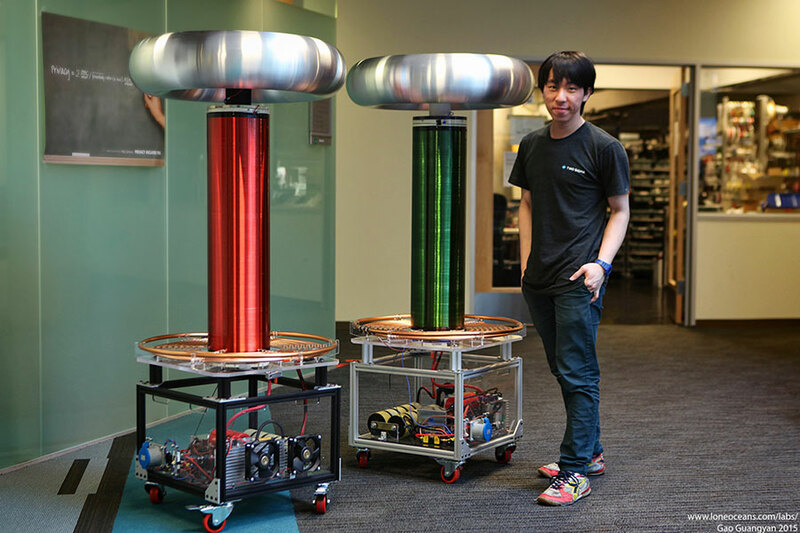 These coils have been developed around modern IGBT technology, and at time of development, represents one of the largest and most powerful musical Tesla Coil systems in the South East Asia region. The Model 82 coil system is so named, being the 2nd 8-inch secondary diameter platform of my design. 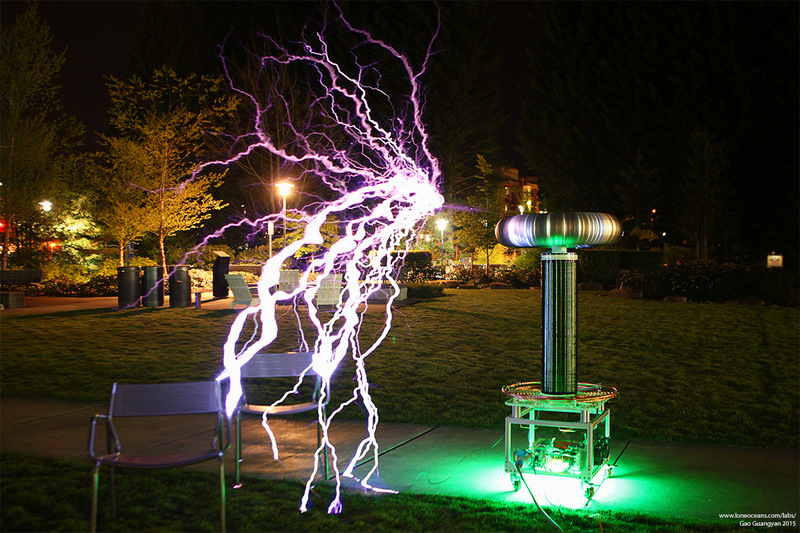 See my Model 81 Tesla Coil page. 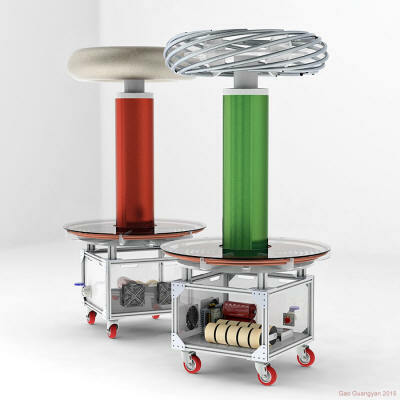 This platform was developed to be compact, reliable and robust, with an intended electrical discharge of easily over 2 meters each coil despite each coil having only a 79cm secondary winding length. 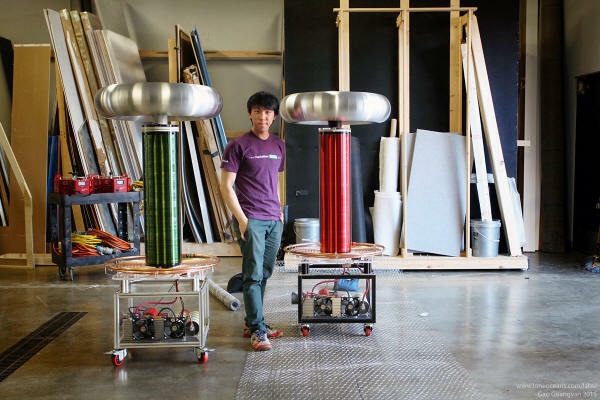 The Model 82 project was designed in the early months of 2015, with the first twin pair of coils completed in early April 2015 as part of a commissioned project and their performance surpassed their designed goals with ~9 feet spark length acheived. 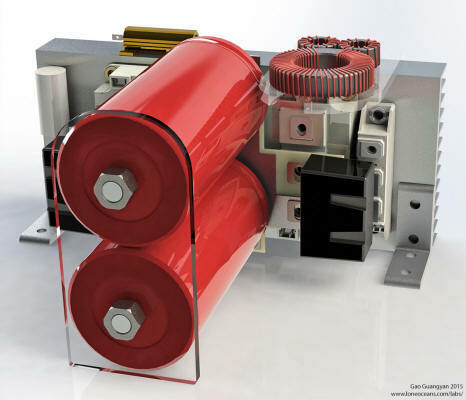 Depending on operational characteristics, the average operating power of each coil ranges from about 1 to 8kW RMS, with a maximum pulse operating power exceeding 550kW. These coils are controlled via my custom MIDI synthesizer which supports playback from a computer or a MIDI device such as a keyboard, supporting up to two channels and two notes of polyphony. 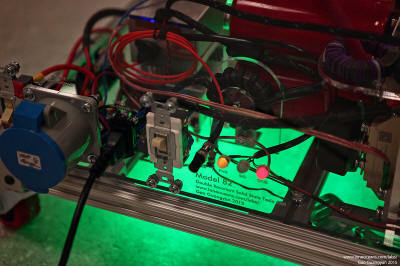 The coils can also be operated in a 'stand-alone' mode. 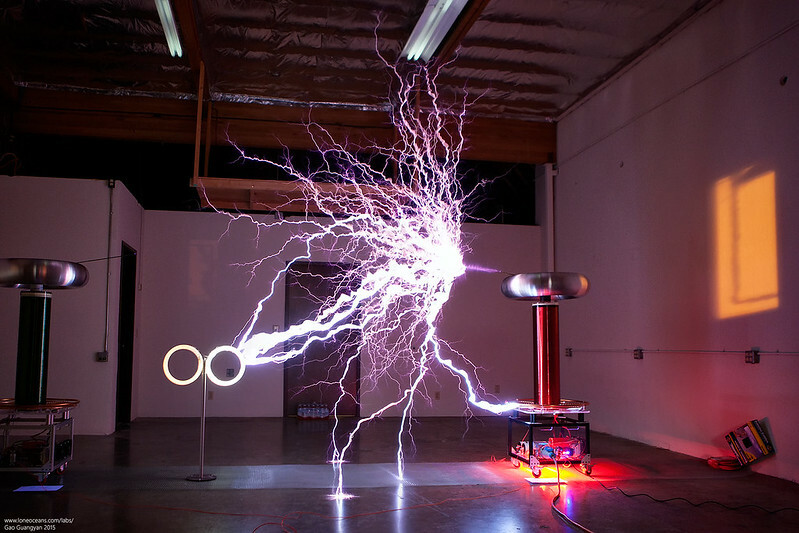 Control is done remotely and safely via a fiber-optic cable sending signals from the controller to the Tesla Coils. 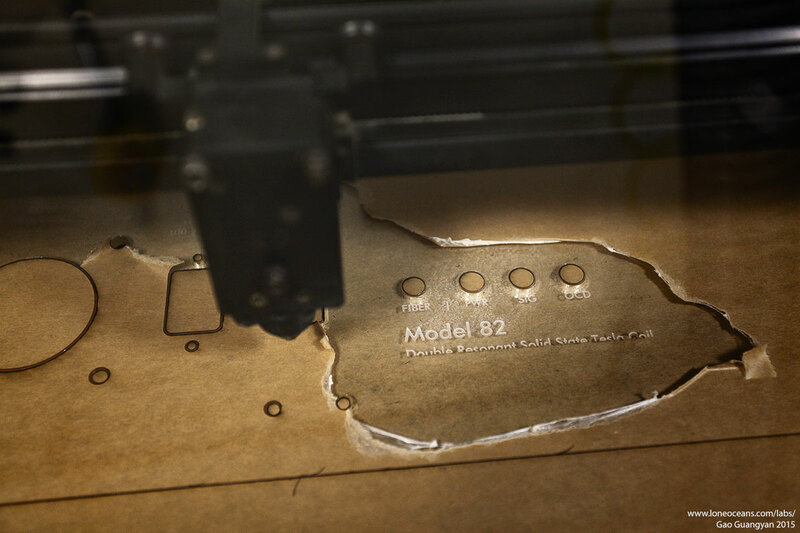 Development of the Model 82 coil was done completely in CAD (Computer Aided Design) to ensure proper dimensioning and to ensure that everything would fit in place. This also allowed for me to have a 'preview' of the complete coil, and also aided in actual construction since all dimensions were already determined. 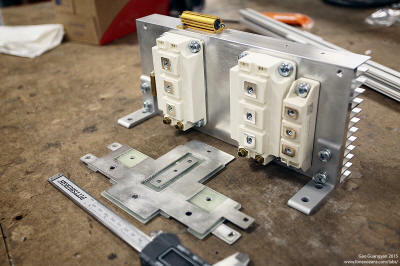 Electrical simulations were conducted as well. 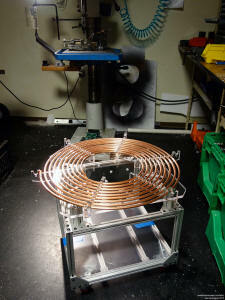 The primary coil was constructed using standard 3/8" flexible copper tubing. 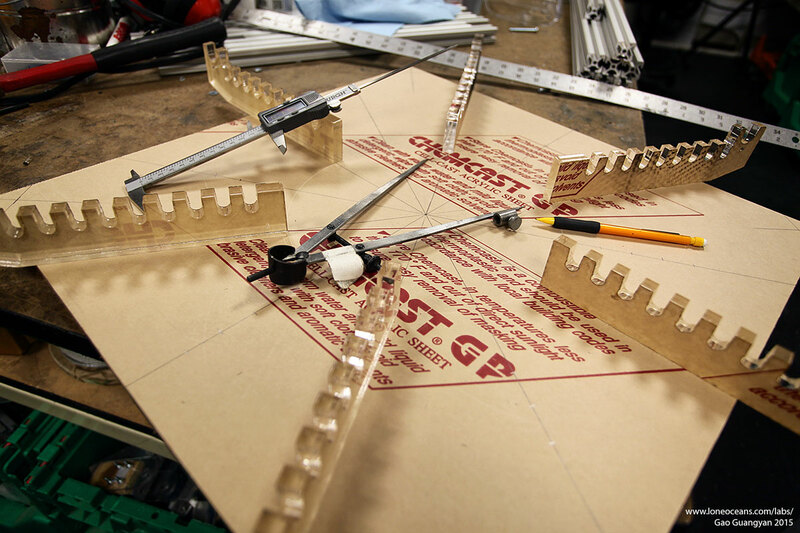 For quick construction, supports were laser cut from 12mm acrylic sheets, and the entire setup sits on a thick acrylic table. The primary supports were designed in such a way to allow the copper tubing to be press-fit into place with not additional clamps or fasteners required. The result is a strong and tidy primary coil, whilst being simple to construct. Unfortunately the low melting point of acrylic limits both the maximum possible current and duration before they melt! 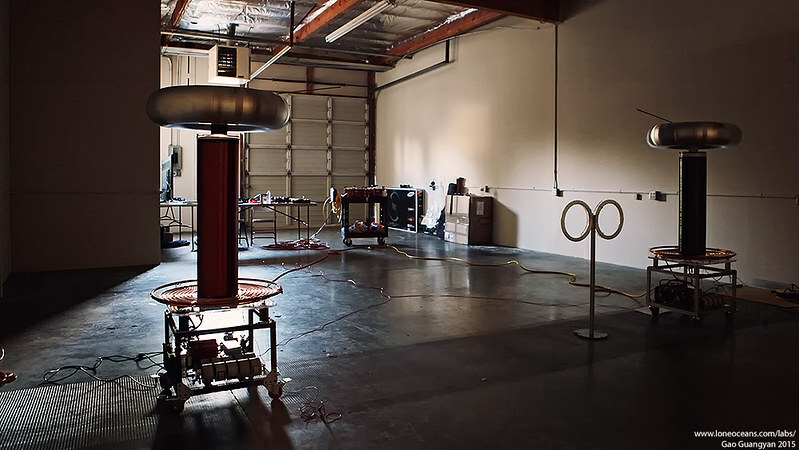 However in practice, the coils have been run at full power for several minutes and still remain cool enough for the supports. 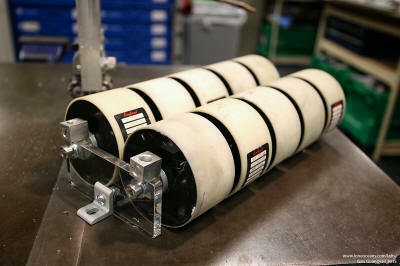 The secondary coil was made using 8" diameter white PVC pipe, each sanded and cleaned before winding. 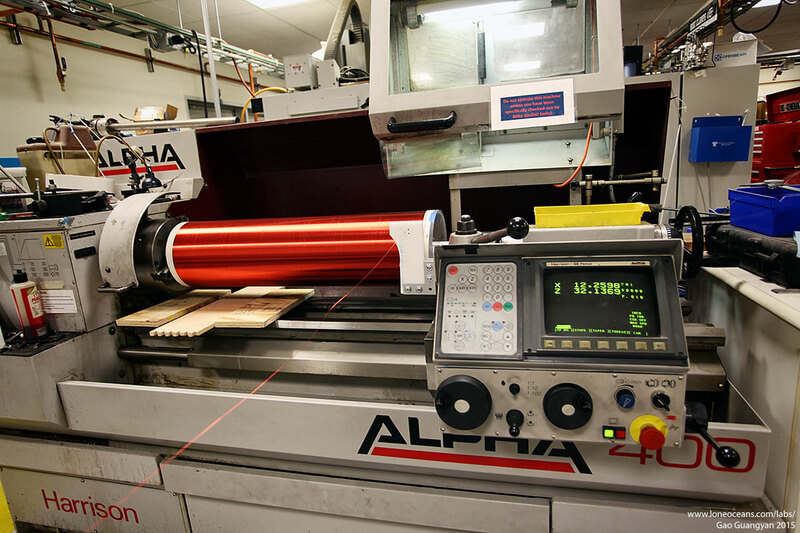 The winding aspect ratio was arbitrarily chosen to be about 1:3.6 simply to maximize the length of pipe which could be fit onto a particular lathe I was using. Winding the coil on the lathe allowed me to automate the process, and each coil took less than an hour from start to finish. The coils were then coated with polyurethane varnish for protection. 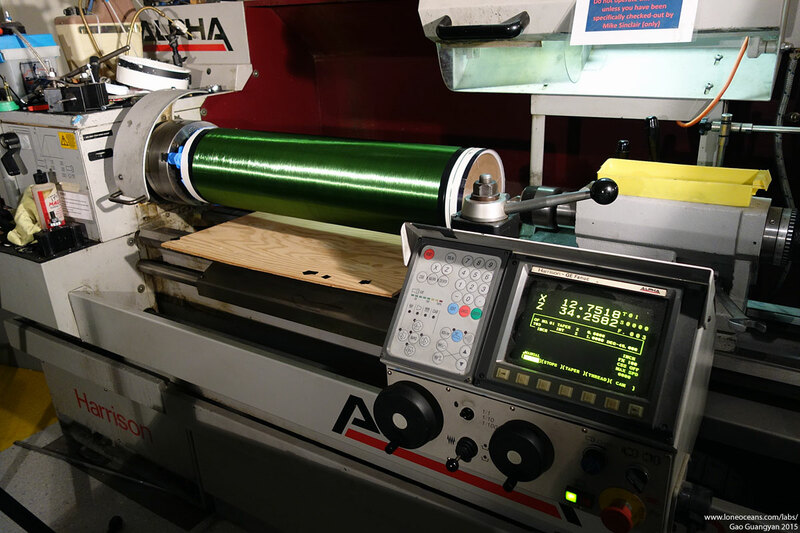 The coil can be easily disassembled into 3 main parts for easy transportation - the Toroid, the secondary coil, and the rest of the coil. 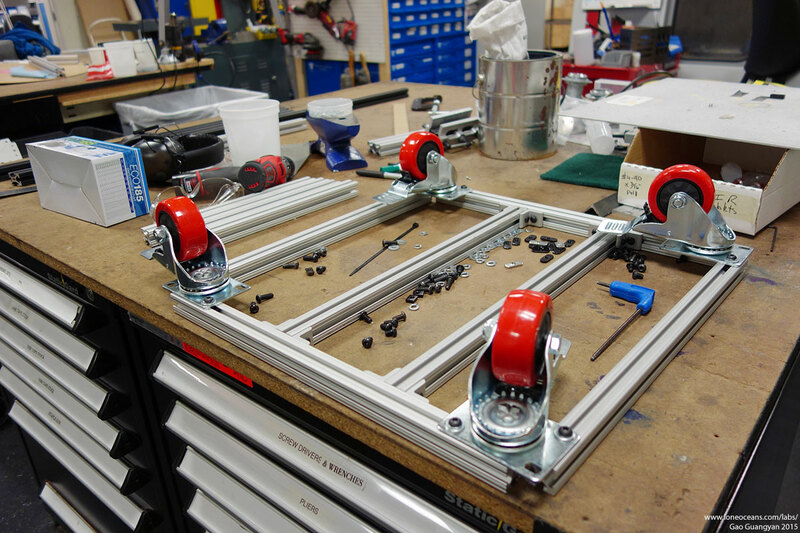 All of the electronics and and support for the coil was constructed to fit in a frame measuring around 18" x 18" x 10", made from 80-20 aluminium framing. This allows extremely quick construction while being very robust and strong. Side panels are constructed from clear acrylic with laser-cut mounting holes for power socket, switches and indictor lights. 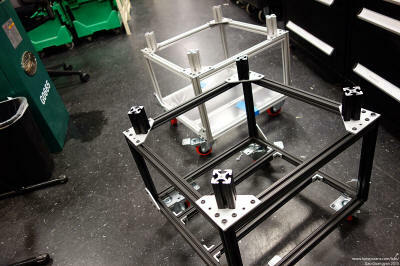 The base is made from stronger polycarbonate. 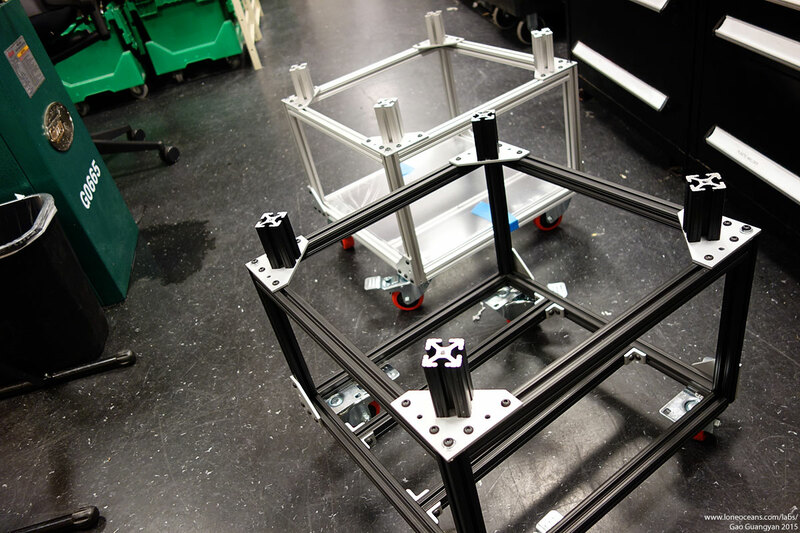 The entire setup sits on 3" locking rubber wheels for easy transportation. Note that (not shown) care was also taken to ensure discreet electrical breaks in the 'loops' created by the framing to reduce inductive losses from the primary coil during operation. 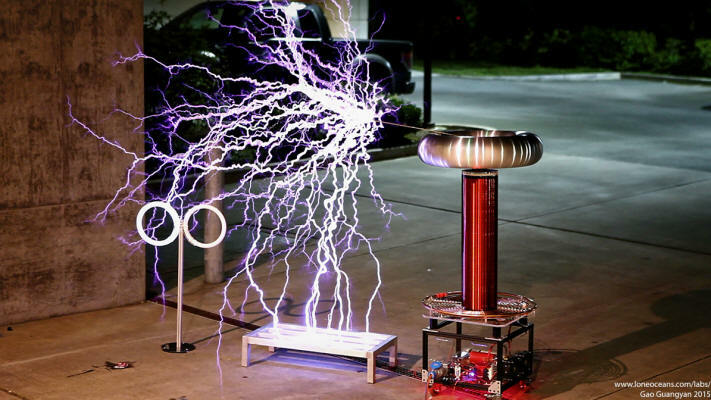 The heart of the Model 82 Tesla Coil is the power inverter made out of the best modern IGBTs on the market today. 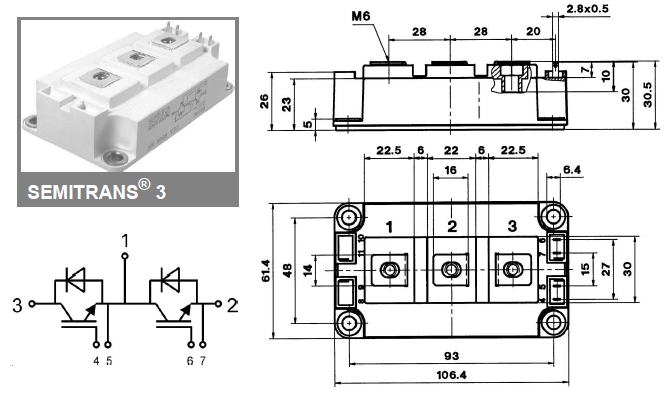 Each coil contains a H-bridge comprising of two high-speed Semikron IGBT power modules, each capable of 300A hard-switched at 800V. However these transistors can be* operated at significantly higher pulse power capability by employing predictive switching allowing for resonant zero-current switching. With a low duty cycle and a robust gate drive, these IGBTs can be driven up to 1000Apk+ at 600V at up to 70kHz. 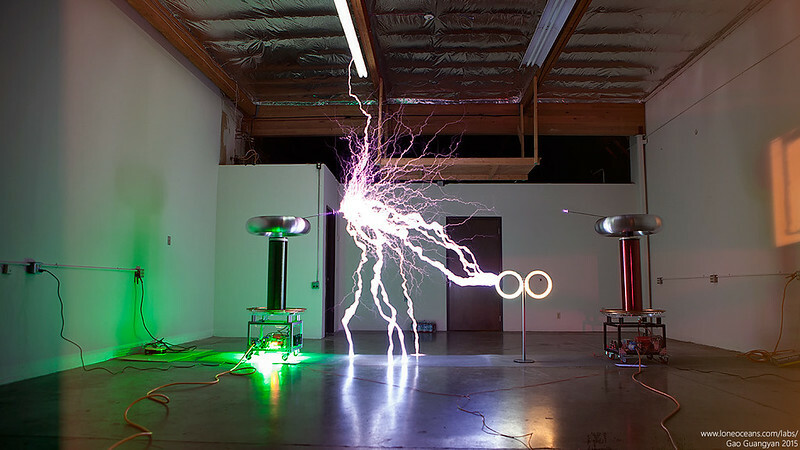 The Model 82 Tesla Coil system uses 62mm SEMITRANS 3 series IGBTs from Semikron. Careful thermal analysis was conducted to ensure that the junction temperature not be exceeded. Indeed significant over-current can cause die delamination and damage the chip metallization, causing premature failure. 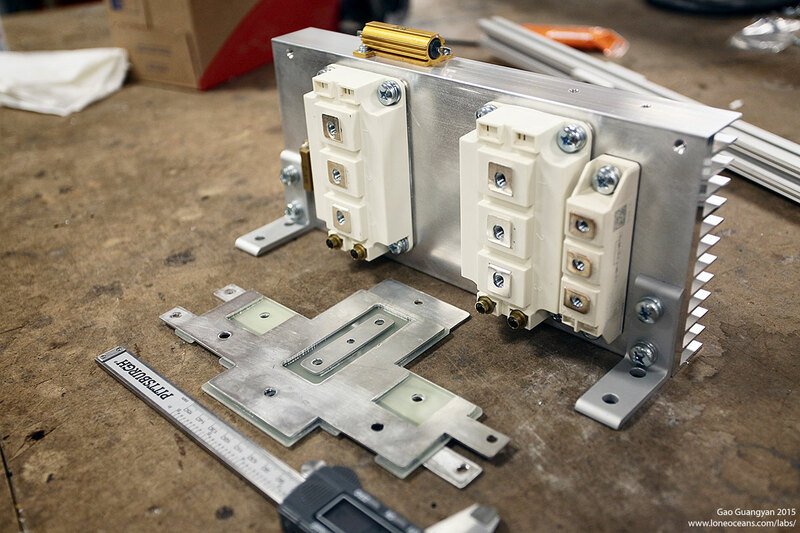 The H-bridge was specifically designed with an ultra-low inductance layout via a custom laminated bus, machined from aluminium sheets and FR-4 fiberglass. This allows the physical location of two high-ripple current bus capacitors and two 2uF 1kV snubbers capacitors connected to the inverter in an extremely low inductance design for the best switching performance and reliability. This combined with predictive resonant switching leads to near perfect ring-free resonant switching. The entire setup is mounted on a large heat-sink cooled via two 120mm high-speed fans. Because of the high RMS currents the resonant capacitor will face, it is imperative to design a resonant capacitor capable of handling this enormous power. 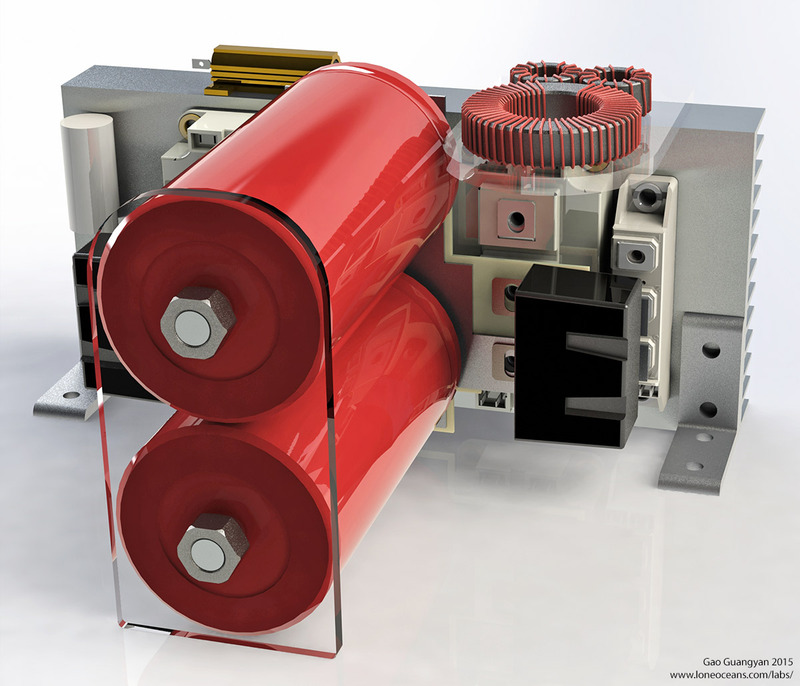 A total of 10 axial-type cylindrical GTO snubber capacitors were used, each being 580Vrms and 3.75uF each. These polypropylene film capacitors are extremely robust, and in series form a 5.8kV 375nF tank capacitor, more than capable of handling the high RMS power for the Model 82 coil. 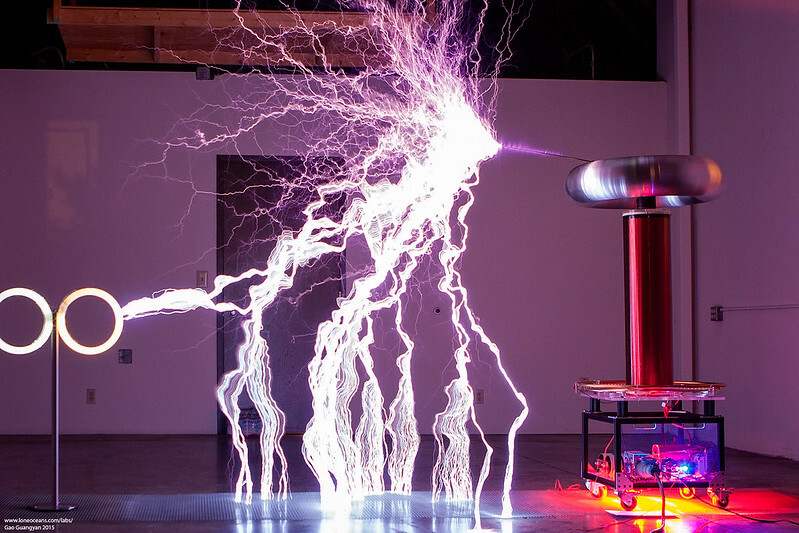 Due to the massive ~1000Apk currents running in the primary circuits, the Model 82 Tesla Coil system utilizes predictive switching in the main inverter. In short, a predictive circuit allows early switching of the main transistors in the inverter. In this way, the IGBTs are switched a fraction of a second before zero current crossing. Because the transistors take a finite amount of time to switch, this allows the transistors to fully saturate just at the point of zero current crossing. 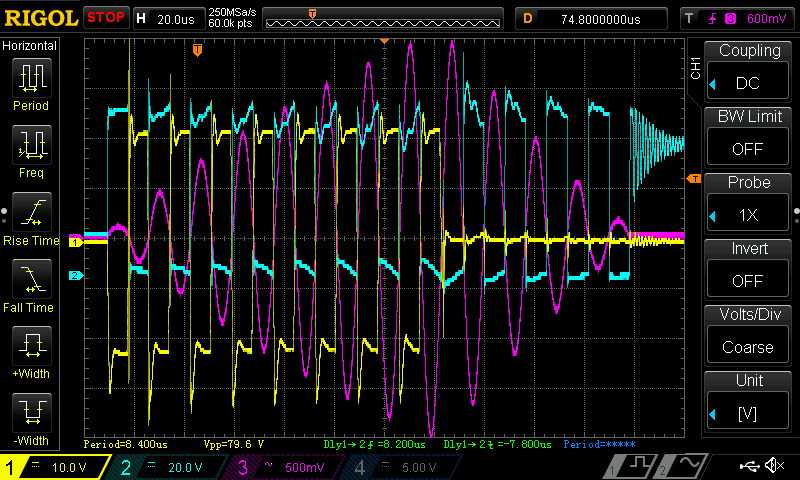 This results in significantly less dI/dt switching spikes, leading to extremely clean switching with minimal switching loss. Scope shots 1 to 4 show increasing phase lead. Magenta = primary current, Cyan = V_ce, Yellow = V_ge. Scope shots 1 to 4 show images demonstrating less to more predictive switching. Image 3 is the critical point near perfect zero current switching. Notice how 1, 2, and 4 shows ringing on the bridge and gates, which are mostly absent when tuned just right. The critical part to note is that Vce drops just before the IGBT turns on. Low voltage test at 68VDC on the bus, reaching just over 200Apk operating at just about 60Khz. Finally, above is a scope shot of the test with the coil operating just over 200Apk with perfect switching at around 70VDC on the bus. In actual operation the primary circuit will see a maximum of just less than 1kA, though practically speaking the circuit may be able to handle up to 1.5kA. Some scope shots were taken during another tuning at 400A in Dec 2015. The following shows screen shots for the Red Model 82. Here we see the effects of proper resonant switching resulting in beautiful clean outputs. Gate resistors are 5.1 ohms. 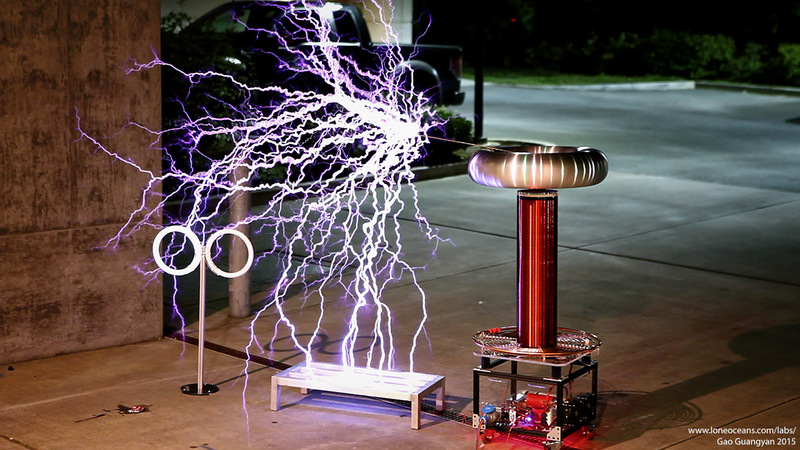 The Model 82 Tesla Coil twin system was completed in early April 2015 as shown above. Each coil stands over 5 feet tall (>1.5m). First light of both coils took place around March 2015 - both coils performs very well, and both were running at about 200VAC input from a single 4kW Honda generator which was struggling to keep up! It's challenging to find a place to run the coils. Regardless, I managed to find a location and the coils were tuned up further. The results are pretty spectacular. Below shows the coils running at about 220VAC input from a 30A power line. 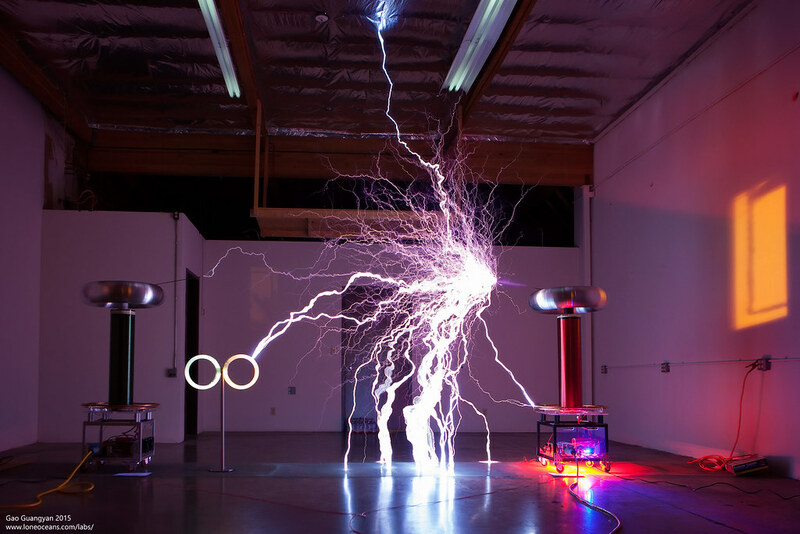 It was difficult to measure the maximum spark length since the sparks were very much wanting to just hit ground! 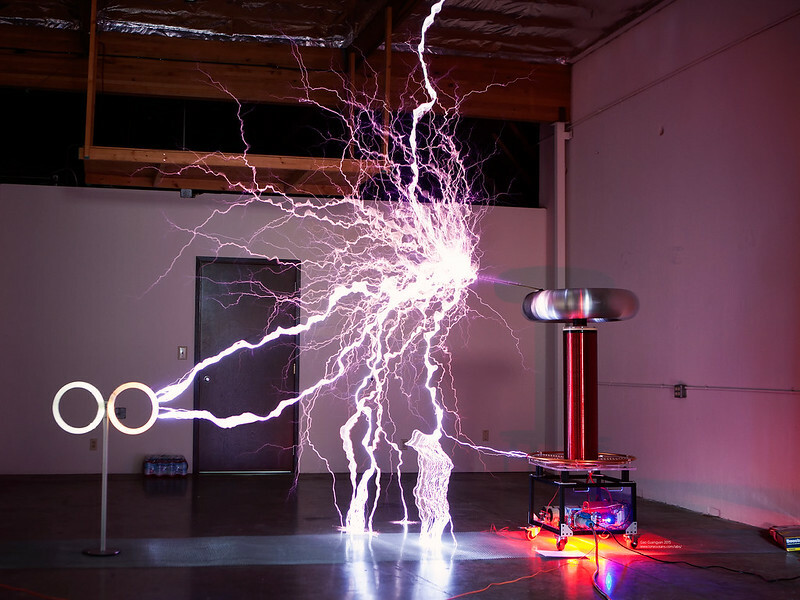 A long spark captured in a photo. The gap here is 8.5 feet or 2.6m. 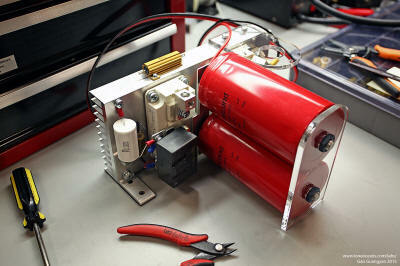 Maximum spark length was just about 9 feet at the current bus voltage (220VAC in) and with OCD set just over 800A. Finally some videos of the coils in action! For more information and for project commissions, please contact me via my contact information below.